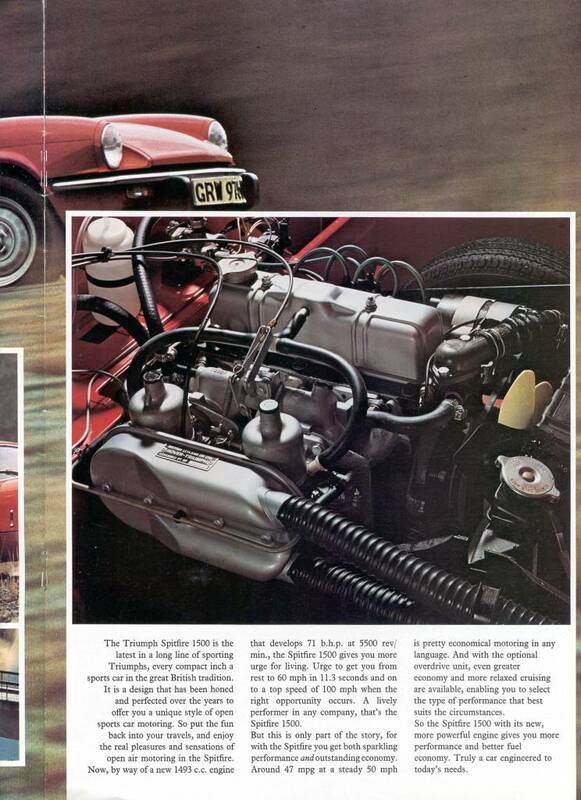 The Triumph Spitfire, unassuming as it may seem, is a car steeped in history. It was successful in racing (Le Mans) and in rallying, and it had a production span of 18 years, in which many model changes took place. This page gives a highly condensed view on the rich Spitfire history. If you want to know more, I can recommend the books mentioned in the bibliography at the bottom of the page. The history of Triumph cars dates back to 1923, although before that time, the company already made bicycles and motorcycles. During the 1930's, Triumph produced a number of sporting and fairly expensive cars, which were not marketed very successfully. High costs, too many models and comparatively slow sales led to bankruptcy and a takeover by a steel making group in the late 1930's. During the early months of WW2, the company was geared towards war production for the British government. But in November 1940, the Coventry production facilities were almost completely destroyed by German bombing. On 31 December 1945, Sir John Black of the Standard Car Company acquired the Triumph name and the remaining assets of the company. 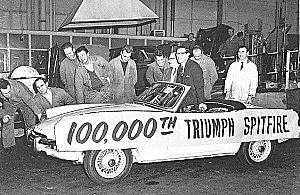 Sir John planned to use Triumph as an upmarket 'badge' for his mass-produced Standard models. The Triumph Renown Saloon was already outdated when it came out in the late 1940's. After WW2, England was effectively bankrupt and the order of the day was 'export or die'. When Jaguar and MG turned out very successful in selling their cars in the U.S., Sir John changed his badge-engineering plan and started to develop the name Triumph as a marque on its own. 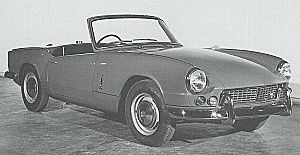 The first attempt at a Triumph sports car was the TRX, a prototype based on a Standard Vanguard saloon chassis and engine. This failed to mature into a production model. The second attempt was called 'TS20' and appeared at the London Earls Court motorshow of 1952. Reactions were positive enough to develop it into a production model, the TR2, which was introduced in March 1953. The TR2 was a huge success and was followed by the largely similar TR3 and TR3A. The Triumph saloon models of the day did not fare as well. The Renown, with its 'razor edge' styling, introduced in 1946 and its much smaller, oddly-styled sister the Mayflower (1950) did not sell particularly good and were gone by 1954. Triumph was making a name for itself with its sports cars across the Atlantic, so in 1957, the Standard Ten saloon was marketed in the U.S. as a Triumph TR10, clearly borrowing some of the newly won reputation of the Triumph marque. In 1956, Standard-Triumph, as the company was now called, started development on a completely new saloon model. Due to difficulties in finding enough production capacity for a full monocoque, the engineers decided on a simple separate chassis-and-body construction. This also enabled the factory to produce the car very cheaply and at the same time it made the production process very flexible. Different body styles could be produced, without a complete retooling. Other advantages were that the chassis could be used as a jig for building the body and that overseas production from parts kits was greatly simplified. The car was marketed from 1959 as the Triumph Herald. In 1958, Austin launched the Austin-Healey Sprite, a tiny little sportscar designed by Donald Healey. It was an instant success, which did not go unnoticed in the Triumph offices. Triumph had already thought about marketing a small sportscar of its own. After the austere little Sprite had entered the market, Triumph were convinced they could do better than Austin. Full-size wooden model, called a 'buck'. This was used to shape body panels on. Construction of a prototype called 'Bomb' was started in September 1960 on the basis of a 948cc Herald chassis in the Turin studio of Triumphs new Italian designer Giovanni Michelotti. Apart from the height of the doors and its lack of wind-down side windows, it looked remarkably like the production model. Unfortunately, by the spring of 1960, car sales on the home market had started to fall dramatically and in November 1960, the company books were showing red figures. It so happened that the Leyland Motors company, manufacturer of trucks and buses, was looking for expansion into the car market. Leyland made a successful take-over bid on Standard-Triumph in December 1960 and took full control of the company in April 1961. During the take-over process, the 'Bomb' project was stopped. The prototype was kept hidden away and was only revealed when a Leyland executive asked what that little car under the dust sheets in the corner of the design department was. The executive liked the 'Bomb' immediately and on 13 July 1961 ordered the project to go ahead for production. A prototype Spitfire chassis was tested on the road with a shortened Herald body. A development car like this is called a 'mule'. 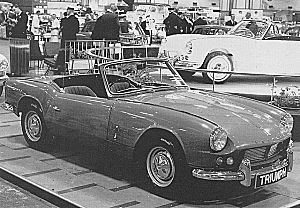 The Triumph Spitfire, as the production car was to be called, would be built on a backbone chassis-frame, based on the Herald frame, but shortened by 8.5" (216mm) and without the Herald's side members. This enabled the designers to make the car much lower, as the seats could be placed at the side of the chassis instead of on top, like in the Herald. The lack of side members did call for the use strong structural sills. The engineers had also learned from criticism about the flexibility of Heralds on the road. This was due to the fact that Herald bodies were largely bolted together - a feature still loved by restorers today, but a source of early quality problems in the days of production. It was decided to give the Spitfire a completely welded body, attached to the frame by twelve bolts. The very useful Herald feature of a bonnet that consisted of the complete front part of the car hinging forward was retained on the Spitfire design. Triumph was careful to make the car better than the Austin Healey Sprite in many respects. More legroom, wind-down windows (the Sprite still had old-fashioned side curtains) a wider cockpit, stowage space behind the seats, space for an overdrive unit and of course unrivalled access to the engine bay by that big, forward hinging bonnet. The first true prototypes meant for testing were not finished until the spring of 1962. Most of the road testing was completed by August of that year and the car was launched at the 1962 London Motor Show in October. Compared to today's cars, development time for the Spitfire was very, very short. Of course, the name 'Spitfire' was first used by Supermarine for the famous WW2 fighter aircraft, designed in the 1930's. It is not known if Standard-Triumph obtained prior permission to use the name. According to Triumph historian Graham Robson "The 'Spitfire' name came along while prototypes were in development, but there does not seem to have been *any* connection with the famous fighter aircraft, though publicity shots were eventually taken with car posed in front of 'plane. It is not recorded if the makers of the 'plane ever objected to its name being 'stolen' for use on a car." I received E-mail from a visitor to this page saying that Standard-Triumph was allowed to use the name after producing Spitfire aircraft parts in WW2. 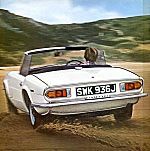 It's certainly true that Standard was involved in making parts and even complete aircraft during the war, but there's no evidence that this could be linked to the Triumph Spitfire's name. I received another message saying the name was used after Vickers (owner of Supermarine, the original makers of the Spitfire aircraft) produced the Vickers Vanguard. Standard-Triumph produced a car called Vanguard. Again, there are no other sources to back up this theory. So neither of these last two stories are backed up by reliable sources. If you know more, please let me know. The Spitfire4 was first presented to an enthusiastic audience at the 1962 London Earls Court motor show. After a purchase tax reduction, the price in 1962 for the Spitfire4 was 641 Pounds Sterling, which made it more expensive than the 587 Pounds Austin-Healey Sprite. But then the Triumph offering was much more of a sports car than the Austin. The price difference remained throughout the life of the cars - but it didn't stop the Spitfire from always outselling the Sprite/Midget range (except for one year, due to workforce strikes). The first Spitfire model, called the 'Spitfire 4' (4 stood for the number of cylinders in the engine) was well-equipped for the time, even though it came with a tent-like roof, which you more or less had to build yourself, and the heater was an option. It took some time before overdrive and wire wheels were available. Still the car took off in America, selling 6,224 in 1963, 8,761 in 1964 and 9,097 in 1965. Total production ran to more than 45,000. It was a welcome addition to the already popular but much more powerful and expensive TR4 model. Top speed was 92mph (147km/h) and 0-60mph (0-96km/h) took about 17.3 seconds. This may not be something to write home about today, but in 1962, this was quite something for a small, inexpensive sports car. Triumph left little time to come up with tuning kits for its new sibling. These came in the form of high-compression cylinder heads, new inlet and exhaust manifolds, two twin-choke Weber 40DCOE carbs and a high-lift camshaft. For the serious competition-minded motorists, stronger pistons, connecting rods, crankshafts, clutches and Vitesse close-ratio gears were also available. Outwardly, the Mk2 differed very little from the original Spitfire4. Only the grille was changed to a design with horizontal slats instead of a cross-hatched pattern. In 1964, Standard-Triumph's competitor BMC (British Motor Corporation) came up with an improved Austin Healey Sprite and MG Midget. In an answer to the marketing success of the Spitfire, it now had a proper bootlid and wind-up windows. Standard-Triumph responded with the Spitfire Mk2 in March 1965. This had a slightly more powerful engine (67 bhp instead of 63), thanks to revised manifolds and valve gear. Inside there were proper carpets instead of rubber covering on the cabin floor and the previously exposed metal on the inner door tops was now covered with trim. Hardtop, wire wheels, overdrive and even the heater were still optional. More than 37,000 Mk2's were built. The Spitfire Mk3 was instantly recognisable by its raised, 'bone in the teeth' front bumper. The much-improved Mk3 went into production early in 1967. It did not go on sale in the USA until March of that year. The most obvious outward change was the 'bone-in-the-teeth' raised front bumper, introduced to comply with American safety legislation. Most important change, though, was the new 1,296cc engine, which produced a healthy 75bhp. The increased capacity was achieved by enlarging the cylinder bore from 69.3 to 73.7mm. Minor changes were larger front brake calipers, a larger 15" steering wheel as used in the TR4, a wood-veneer dashboard, different seats and the fact that the electrics of the car were now negative earth. The 100,000th Spitfire to roll off the production line on 6 February 1968 was a Mk3. Due to ever-increasing mutterings of both customers and the motoring press about the build-it-yourself convertible top, the Mk3 came with a new, much improved folding softtop. This no longer needed stowing in the boot, but was more or less permanently attached to the car. Equally increasing criticism of the somewhat 'exciting' handling, due to the swing axle rear suspension, wasn't dealt with until the advent of the MkIV. It did not prevent the Mk3 from being popular with the racing fraternity. Especially its free-revving and powerful engine made it eminently suitable for the track. Many American owners installed a 'camber compensator' to make the car less of a handful on corners. Total Mk3 production would eventually reach more than 65,000. In January 1968 Leyland Motors, the company that had been the owner of Standard-Triumph since 1961, took over British Motor Holdings, which included Jaguar, Daimler and the whole of the BMC company, including Austin, Morris and MG. The merged company was rechristened British Leyland. One of the results of this merger was that competing sports cars (Triumph Spitfire and the Midget/Sprite range from MG and Austin-Healey) were now built by the same company. The Spitfire MkIV had a fresh new look, with a distinctly restyled front and rear and a smart new hardtop. In 1970, Triumph came out with what can be called an almost complete re-skin of the Spitfire, executed by the Spitfire's original designer Michelotti. The front was cleaned up, losing the trim strips on top of the bonnet and the chrome headlamp surrounds. A black plastic grille and black plastic bumper underrider covers were added. The doors were fitted with more modern, flush-fitting handles and the wheelarches were flared slightly. The windscreen's height increased by 2"/50mm and its frame became an integral part of the scuttle construction, so it was no longer removable by simply unbolting it. The styling of the rear was brought into line with other Triumph models like the Stag and the 2000 saloon. This also brought slightly improved boot space. The rear bumper now came in one piece, instead of the previous two small bumpers on the corners. The only outer panels to remain completely unchanged were the sills. Triumphs own stylists came up with a smart new hardtop, with a much flatter roof panel than the previous bulbous offering, opening rear quarterlights and a flat rear window. The hood frame of the softtop was partly covered by black plastic moldings, in an effort to prevent injury to the occupant's heads. Designer Michelotti had proposed popup headlights, as seen here on a prototype MkIV. It didn't happen because of high production costs and the fear that these would soon be outlawed in the US. The dashboard was of the type that had already been introduced in the 1969 Mk3's for the US market: cockpit-wide black plastic, with the main instruments in front of the driver, instead of in the middle. Later in its production life, a wood-veneered dashboard was fitted. At last, black padded sun visors, safety belts and a heater came as standard on all markets. Cars fitted with overdrive now had a sliding switch on the gearknob instead of a lever on the steering column. 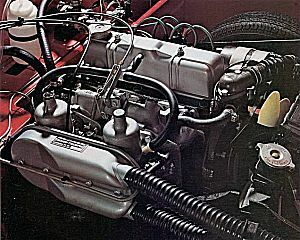 The MkIV basically had the 1,296cc engine from the Mk3, but to simplify parts manufacture and supply it was fitted with the larger conrods of the six-cylinder engines. Contrary to popular belief, the MkIV engine was not detuned form the start. Initially, its quoted output was 63HP, as opposed to the quoted output of 75bhp for the Mk3 engine. The only difference was that the 63HP was a result of measuring according to the German DIN system - actual power output was no different. Still, the MkIV was slower than the Mk3, due to higher weight, a taller final drive (3.89:1 as opposed to 4.11:1) to improve fuel economy, and a new gearbox with a taller first gear (which, incidentally, was now synchronised). At last, a major design weakness in the rear suspension was properly dealt with. Handling in corners of previous Heralds and Spitfire models had been 'interesting', with dangerous tuck-under of rear wheels easily achieved. This was caused by the transverse rear leaf spring assembly being bolted solidly to the top of the differential casing. Thanks to a simple modification of the rear axle, handling of the MkIV was much improved. The solution of the Triumph engineers was both effective and cheap: just the bottom leaf of the assembly remained fixed to the differential casing, but the others were free to pivot around a central axis. This transformed the handling of MkIV Spitfires compared to earlier models. Finally, Spitfire drivers could throw their cars about without the danger of being launched into the scenery. Wire wheels were still an option, but they were no longer of the centre-lock type, but of the much simpler and cheaper 'bolt-on' variety. Later on, the rear axles were lengthened by 1" (25.4mm) each, thus widening the car's rear track and improving roadholding. Top speed of Euro-spec MkIV's was 97Mph (155km/h) and 0-60Mph (0-96km/h) took about 12.5 seconds. From 1972, a slightly detuned engine was fitted, lowering the numbers to 95Mph (152km/h) and a disappointing 14.5 seconds. Note: previous marks of Spitfire were called Spitfire4, Mk2 and Mk3. The MkIV was not designated Mk4 to avoid confusion with the original Spitfire4. Two years before the end of MkIV production, Triumph had already introduced the 1,493cc engine in MkIV's for the US market, albeit with a single Zenith Stromberg carburettor. Changing the design to conform with US emission regulations had robbed so much of the old engine's power that an increase in swept volume was badly needed. In December 1974, the 1,493cc engine was also introduced on other markets, in a mildly reworked model called the 'Spitfire 1500'. The engine, which was basically a stroked version of the old 1300cc engine, produced 71bhp and mated to a simpler 'Marina' gearbox, turned the Spitfire into a genuine 100Mph (161km/h) car for the first time. Fuel consumption was no higher than before but the car was much more flexible to drive, thanks to improved torque. 'Houndstooth cloth' upholstery, introduced in 1977. Throughout its production life, many detail changes were made to the 1500. The main visual upgrade happened in 1976, when - in keeping with the fashion of the time - the bright stainless steel windscreen wipers, chromed door handles and door mirrors were replaced with matte black items. In 1977 the old steering column switchgear, which still stemmed from the days of the Triumph Herald, was upgraded to more modern TR7 column stalks. A few months later, the all-vinyl seats were replaced with cloth-vinyl seats. Apart from minor changes, British Leyland did not invest in the Spitfire. BL originally planned to keep the Spitfire in production until 1982, but in 1980 it was quickly discovered that the old Triumph 1,500cc engine could not possibly meet new Californian emissions regulations. Since around half of Spitfire sales at that time took place in California, this meant that production halved and became uneconomical. Besides, the car was an old design after 18 years in production and could no longer compete with more modern offerings like Fiat's X-1/9 and BL's own TR7. The last Spitfire 1500, an Inca Yellow specimen with hardtop and overdrive, rolled off the assembly line at Canley in August 1980, bearing commission number TFADW5AT009898. It was never sold and is still in the British Motor Heritage museum at Gaydon today. The end of the Triumph story is not a happy one. In the eighties, British Leyland was troubled by bad products, bad management and a less than motivated workforce. New products like the Triumph TR7 suffered from underdevelopment and mediocre quality. 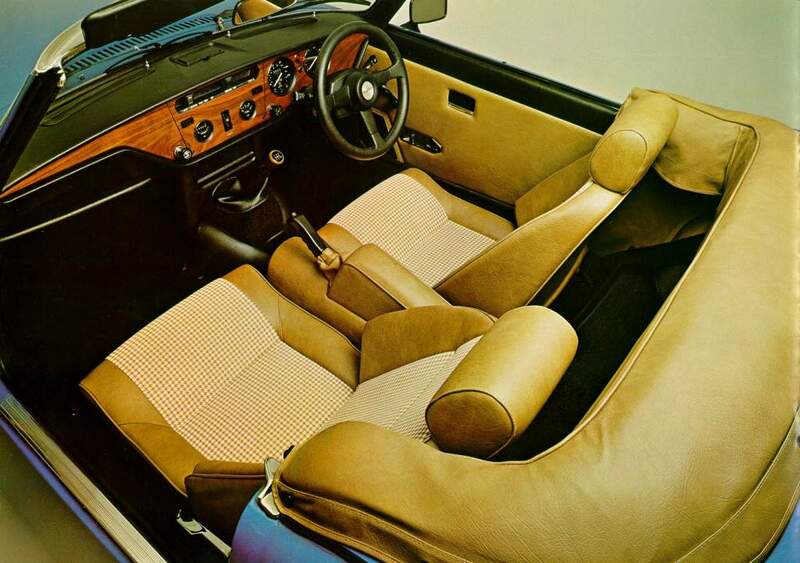 Production of the TR7/8, the last true Triumph sports car, ended in 1981. The Triumph name appeared for the last time on a saloon car named Acclaim. This was little more than a rebadged Honda Ballade, which was in itself based on the Honda Civic platform of the second generation. The Triumph brand name is today owned by BMW, along with other famous names like Riley, Wolseley, Morris and Austin. If you feel there is a mistake or serious omission on this page, please don't hesitate to tell me. It can only help to improve this site.